AlphaEMS was recently presented an Award by City of Fremont council members and economic development during recent printed circuit board manufacturing facility tour. 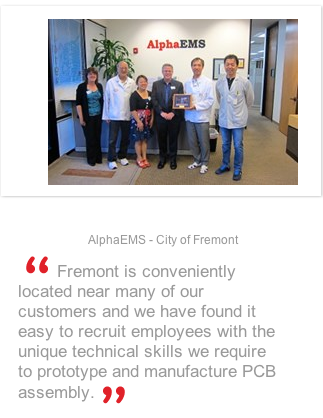 AlphaEMS, a Fremont, CA-based printed circuit board (PCB) prototyping and electronic assembly services firm, has announced today that the City of Fremont recently honored it with an Appreciation Award for contributions to the business community and citizens of Fremont, CA. In addition to workshops and programs designed to help local businesses grow, City of Fremont officials make an effort to visit several Fremont-located businesses each month to learn about individual businesses and their requirements. The Appreciation Award was presented to AlphaEMS during a recent visit where AlphaEMS gave a tour of its 48,000 square foot PCB assembly production facility to key Fremont councilmembers and economic development staff. The City presented AlphaEMS with the award as a way of recognizing and congratulating AlphaEMS for its growth and overall contribution to the local citizens of Fremont. They are excited that an electronic printed circuit board manufacturer like AlphaEMS is able to find success in the United States and specifically Fremont.